On this page you will find reports and information about our school and our achievements at national tests (SATs and Phonics tests) as they become available. You will also find other reports which all schools are required to publish. Our latest Ofsted report confirms that we continue to be a good school with a ‘highly caring and nurturing environment’ and that ‘ pupils engage in their learning, work hard and make good progress. 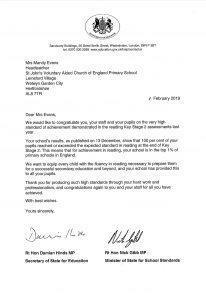 Pupils’ behaviour is excellent.’ We are immensely proud of our school and all that we have achieved together. This would not have been possible without such fantastic children and extremely supportive parents. The incredible hard work and commitment demonstrated by the staff and governors have ensured a high quality, all round education for all our learners. The staff, governors and parents of St John’s are committed to work together to continue to improve even further, so that we provide St. John’s children with an excellent education that meets our mission statement “Learning for Living” and prepare our children for the future.